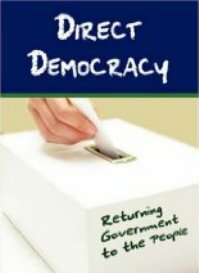 Direct democracy is a way of organising public life that enables citizens to have a direct say over the way in which government is run, both through the electoral process and through other mechanisms that allow for direct participation at all times. Direct democracy is not an ideology like communism, nationalism, socialism or fascism, and is not a form of government that is defined centrally by a small political elite and then imposed on the electorate from the top down. Rather, it is a flexible, constantly-evolving expression of the democratic principle that is developed by the people and for the people. In a system of direct democracy, citizens work in partnership with elected representatives to ensure good governance, with a specific focus on effective and accountable local government. They have a direct say over who is nominated to represent them and in the approval of electoral candidates, whether these are independent or affiliated to a political party. Candidates selected in this way cannot stand for election unless they sign a social contract with their constituency, guaranteeing that they will fairly represent the interests of the electorate, will deliver on clearly-defined performance criteria, will be accountable in terms of the law, and will be subject to recall for non-performance through the exercise of a pre-defined democratic process. Further, in a direct democracy, citizens have the right to participate and be heard in political decision-making, and to collectively call for a referendum on any issue or law should this be deemed necessary by a defined proportion of the population. This applies at any level of government, but specifically at local level. Direct democracy puts political power in the hands of the people in a very real way, and in a way that can be constantly measured and assessed by the people themselves. A system of democracy which effectively puts political power in the hands of political parties with membership figures that represent only a small percentage of the voting population, is not direct democracy. In a system such as this, voters have little or no say over the selection and approval of candidates for election and, once they have voted, they have no direct say over the performance of their elected representatives or over the way in which they, the people, are represented. As importantly, they have little or no say over policy, strategy and tactics, or over the exercise of disciplinary procedures. In a rapidly-changing and increasingly globalised social, economic and political environment, democracy itself must evolve to meet the changing needs of the world’s people. It cannot be the only socio-political system to remain rigid and unchanging. And if democracy is genuinely the ideal - rather than power, money and influence - direct democracy can be the only way forward to a truly representative and egalitarian society. Well, it's happening now in Israel.